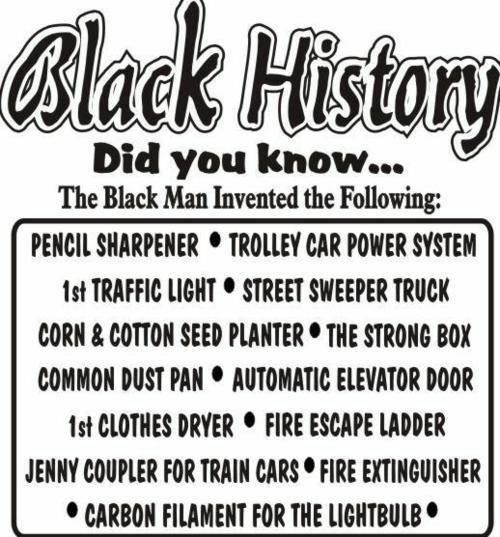 Black History – Did You Know? Your skin is an amazing organ: It has a very capable barrier function, a good blood supply to call in nutrients, and the ability to repair itself. It has its own local immune surveillance system, a support system with collagen, elastic fibers, etc. (like a scaffolding on a construction site), and its own system of nerves. But sometimes that brilliant design is disrupted, and problems, like chronic eczema, emerge. One of the most common causes of chronic eczema is genetics – some people have genes that cause alterations in the skin’s barrier properties and immune functions, which makes them more likely to get eczema, grow certain bacteria, and have ongoing problems. Chronic eczema is also caused by the environmental irritations – friction, chemicals in soaps and skincare products, cold or dry weather, etc. And, believe it or not, eczema is often made chronic by the very the medications, especially creams and antibiotics, that doctors give patients to try to treat the problem. Read more here. Joelle A. Murchison, Associate Vice President and Chief Diversity Officer, The University of Connecticut has been named the 2017 Living Waters Award Recipient. The award will be presented at the 150th Annual Meeting of the Connecticut Conference on June 16-17, 2017 at the Connecticut Convention Center. What WAS the legislature doing? The state’s website, cga.ct.gov, has many useful tools for tracking and reading bills, including a tool to browse bills by subject. However, that tool includes too many specific subjects to get a big-picture view of how the bills break down by subject. To follow a bill’s status click here and if you want to know what the Legislature is doing click here. My bill, An Act Concerning Community Reentry By Persons Who Were Incarcerated, passed both chambers in an overwhelming majority. This bill will seek to improve the rate of successful community reentry for persons released from correctional facilitates through the provision of enhanced employment opportunities. As I’ve said before, there is still major work to be done with respect to the formerly incarcerated and reducing recidivism in the state of Connecticut. There are many programs already underway in Connecticut, and we will continue to build upon and expand those efforts. Sen. Kamala Harris (D-CA) was scolded by a Republican committee chairman Wednesday as she grilled law enforcement and intelligence officials on the Russia probe. The California Democrat sought assurances from deputy attorney general Rod Rosenstein that he would allow special counsel Robert Mueller to fully and independently investigate possible Trump campaign collusion with Russia. “You indicated in your statement that you chose a person who exercises a ‘degree’ of independence — not full independence — from the normal chain of command,” Harris said. Then Sen. John McCain (R-AZ) broke in and asked the committee chairman to direct Harris to let Rosenstein speak. Rosenstein said regulations gave Mueller full independence, and Harris again asked if he could give his assurance in writing, as his predecessors had — and the committee chairman interrupted her. Harris pointed out that Rosenstein had joked about his ability to filibuster, and the deputy attorney general interjected to say he had not been joking. Rosenstein then gave a lengthy answer, as Harris’s time for questions ran out, without offering explicit testimony that he would offer written assurance of Mueller’s independence. “So is that a no?” Harris said, as the chairman called on the next senator for questioning. Global Ministries is excited to report that House of Hope, with thanks to the generous support they received in the initial response to Hurricane Matthew, completed two of the three activities they identified for accompanying those affected by Hurricane Matthew. House of Hope provided food and hygiene items to families in the southwest region, and they worked with each family and child individually to ensure whatever school supplies were lost or ruined by the hurricane were purchased so that their children could begin attending school again. 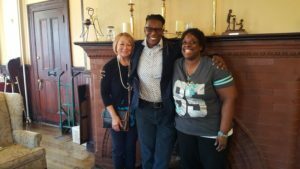 House of Hope is focusing on their third identified priority for accompanying families affected by Hurricane Matthew: to assist in the rebuilding of homes of the 30 families. Continue reading the full update. Thinking About Retirement? Who Isn’t! I’m standing here before you this morning because I’m sad about something that I saw on TV last Tuesday night. It bothered me so much that on Wednesday I called Pastor Camp and told him about what I had seen and how I thought that something should be mentioned in church on Sunday. He too had seen the show and he agreed with me. On Tuesday night I was watching The Last Word with Lawrence O’Donnell (It’s a late night news show). The host said that Martin Luther King was going to get the last word that night. The “last word” is supposedly the most important part of the show and that night it really was. That show was about the Sanitation Worker’s Strike that took place in Memphis, Tennessee back in 1968. I remember when that incident happened so I watched it and as I watched it, I wept and I couldn’t get to sleep that night. My heart was broken and I was ashamed of myself because I hadn’t known the REAL reason for the strike and had never even bothered to look into it. Granted, I was still in school when it happened but I’m not there now. This is a part of our history!! I should have been interested, inquisitive or even just plain curious but I hadn’t been. BUT NOW I AM. 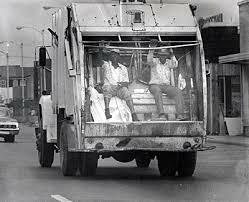 For the 1,100 sanitation workers, who were all male and exclusively African American, the working conditions were atrocious. They worked rain or shine for 10, 12, 14 hours a day but were only paid for 8 hours at about $1.27 an hour. According to the Miami Herald.com, there was no curbside pickup. The workers had to suffer the indignities of going through other people’s backyards picking up their garbage, collecting fallen tree limbs, dead cats, chicken bones and the like. Since there were no garbage cans, these downtrodden men carried metal tubs full of rubbish and rotten food on their heads and these tubs were often rusted through and the garbage leaked on them. The workers often got maggots in their hair and down the collars of their shirts. Blacks tolerated these injustices for fear of losing their jobs until February 1 1968, the catalyst, the “straw that broke the camel’s back” happened. Two sanitation workers, Echol Cole aged 36 and Robert Walker aged 30 tragically lost their lives. They were a part of a four man crew that used a dilapidated old garbage truck that they had complained about for years. It was a rainy day so Cole and Walker wore rain coats. Two of the four men sat in the cab of the truck which left Cole and Walker with the choice of hanging on to the poles on the side of the truck or sitting in the back where the hydraulic packing arm crushed the garbage against the rear of the truck. Because of the driving rain, they chose the latter and then the unthinkable happened. The trash compacter, which had been retrofitted with a makeshift motor, was accidently triggered. The first man was pulled in the compactor and ground up with the trash and second man’s raincoat was caught on the truck and he could not escape so he too was ground up. The deaths of these men and plus many other indignities that they were forced to endure are what caused Martin Luther King to be invited to speak in Memphis. The next day after the accident, the headline in the Memphis paper proudly touted the fact that Elvis Pressley’s daughter Lisa Marie, had been born. No mention of the two sanitation workers. No mention of how their mangled bodies had to be separated from the ground up garbage. No mention that their widows, one of who was pregnant at the time, were given just $500 towards their husband’s $900 dollar funerals in a pauper’s grave. These facts hadn’t been shared because these men were black. I now know that I have no reason to be ashamed for not knowing these facts but I still have a reason to be sad. The people that forced these men to work under these terrible conditions are the ones who should be ashamed. I questioned about eleven fellow African Americans to find out if they knew the reason for the Memphis Sanitation Workers strike. Some of them had heard about the strike but not one of them knew about Echol Cole or Robert Walker. Of the people that I asked, one was a retired teacher who knew none of the facts and the other one had been my sociology teacher when I attended community college a few years ago. She knew about the strike and instantly told me that this was the first time that MLK had attended a rally that was about social class and economic rights rather than just civil rights and race issues but even she was not aware of the story about Echol Cole and Robert Walker. Because of what I told her, she said that she’s going to add their story to her curriculum. SMALL STEPS . . . If you are in a good place in your life, you probably got there on the backs of someone from the past, you probably got there on the backs of people who were treated like animals, you probably got there on the backs of people who fought and died so that you could be treated like the people of GOD that you are and in the case of those sanitation workers, you probably got there on the backs of people that were treated like the garbage that they disposed of … They should always be remembered. Always. I just want you to remember these men, Echol Cole and Robert Walker. Don’t let their deaths be forgotten because you probably got to this place on their backs. What Rights Do Children of Illegal Immigrant Parents Have in the U.S.? What Rights Children of Illegal Immigrant Parents Have in the U.S. The children of undocumented (often called “illegal”) immigrants in the U.S. typically had no say in their parents’ decision to move to the U.S., but must contend with the consequences nonetheless. If those children were born in the United States, they are automatically U.S. citizens, and have all the rights that come with that. Although many people assume that having a child in the U.S. (who is automatically a U.S. citizen) allows that parents to obtain lawful immigration status here, that is not the case. Although many people assume that having a child in the U.S. (who is automatically a U.S. citizen) allows that parents to obtain lawful immigration status here, that is not the case. U.S. immigration law allows a U.S. citizen to petition for parents only upon turning 21. And in order to get through the financial-sponsorship aspects of the petition process, that child will need to be living in the U.S. and earning a high enough income to support his or her parents as well as any other household members. Birthright Citizenship in the U.S. The children of undocumented immigrants lucky enough to have been born in the U.S. will obtain what’s often called “birthright citizenship.” It is conferred automatically, solely by virtue of being born on U.S. soil. This right comes from the Fourteenth Amendment to the U.S. Constitution. During various Congressional debates about immigration reform, there has been talk about eliminating or changing this right. In 2010, for example, some senators publicly announced their opinions that the Fourteenth Amendment needs to be amended. They argued that the amendment is being abused, citing instances where wealthy foreign nationals have come to the U.S. for a brief “vacation” and stayed just long enough to give birth to a child. Of course, they also mentioned the millions of immigrants who enter the U.S. without permission and have children, too. Vicki Kemper Sometimes ignorance is bliss. Sometimes it is easier to be donkey than disciple. We wondered how Colorado’s uninsured rate changed during John Hickenlooper’s time in the governor’s mansion and how it compares with the rest of the country.